Southeast of central Tianjin City, near the confluence of the Haihe River and the Bohai Gulf, the 2,500-hectare (6,178-acre) Tanggu New Area Master Plan redevelops an industrial zone that was once the old port of Beijing into a new Central Business District. The City of Tianjin solicited proposals from several international planning/architectural firms and the School of Architecture of Tianghua University for a design competition. 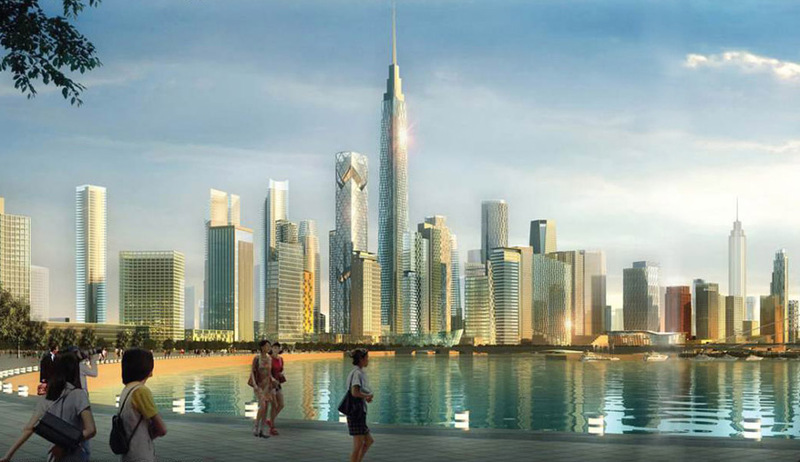 The purpose of the design was to implement a National Strategic Plan to create a major financial center in Tanggu with approximately 60 million square feet of development. A comprehensive road and rail system will serve the mixed-use district of high-rises, historic neighborhoods, and open spaces. Between Beijing and Tanggu, a high-speed train will link northeastern China’s major cities, creating an accessible network of transit from the capital to the Bohai Gulf shore. The Principal of CHS Consulting Group served as a Foreign Advisor to the City of Tianjin Planning Bureau, along with Jonathan Barnett and two Fellows of the Chinese Academy of Sciences. CHS provided guidance on overall circulation patterns, roadway connections internally and across the Hiahe River, a mass transit network, and potential alignment with the location of the high-speed rail station from Beijing, and bus and rail transit connections.